As summer turns into fall, the cars start drifting by looking out at the fields and hills. Some come admiring the colors. Others come to gather walnuts. Others are scouting out the deer. Few cars stop to let the people out. That’s a shame. Summer turns into fall in small ways. Those riding by catch only glimpses as one smear of yellow seems like another. Along my Ozark road summer turns into fall gradually or seems to. Walking along the road lets me see the changes. 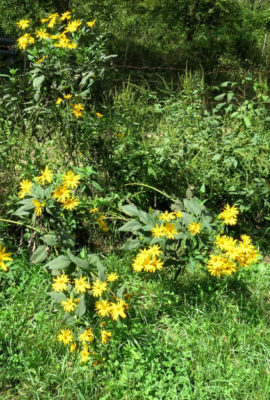 Jerusalem artichokes are among the last sunflower to bloom in the Ozarks. 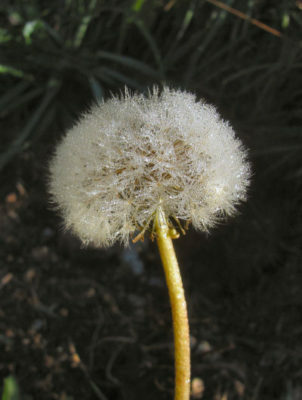 Their stems can reach eight feet high, but are blown over by the wind. Even the wild ones can have artichokes on their roots, if they grow in rich soil. Throughout the summer sunflowers blaze from early Black Eyed Susans into Brown Eyed Susans into a half dozen other sunflowers. White daisy fleabanes cast their small white heads around the yellows. Finally the Jerusalem artichokes open their orange yellow flowers. Yet they are already competing with goldenrod and Drummond asters; both are fall flowers. Summer turns into fall with yellow goldenrods, blue asters, white heath asters and pink tall thistles. The sunflowers disappear leaving fall flowers controlling the road. Overhead poison ivy and Virginia creeper are wreathing the tree limbs with red. The dogwoods are turning dark reddish purple on the hillsides. 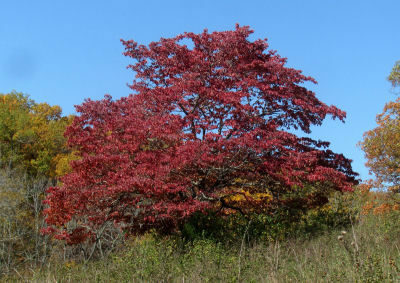 Dogwoods are one of the earliest trees to turn color in the Ozarks. Those in the woods stay purple. Trees in the sun are a rich reddish purple. Close up the leaves set off the scarlet berries. Squirrels are busy now. Black walnuts are their prizes. They snag these and carry them away. Hickories are dropping their nuts. Acorns are ripening on the oaks. 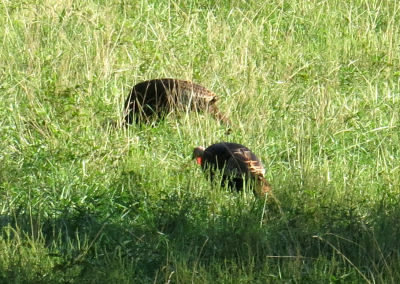 Several grasses are seeding bringing wild turkeys out into the pastures. Although the river oats line parts of the road, the turkeys stay away. They are much too wary to risk the cars. Deer are different. They graze along the road leaping over fences and bounding off when cars come by. Fawns are known now only by their small size and staying with their mothers. Tom turkeys group together in the fall. 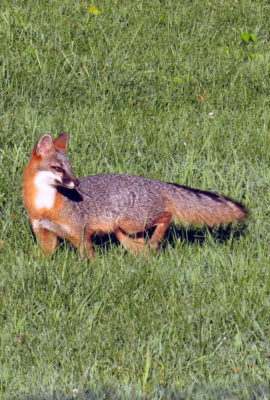 They spend lots of time feeding on bugs and grass seeds in the pastures. This year the road has huge stretches of giant ragweed. Birds are delighted with the seed bounty. They hang on the stouter stems picking the seeds, flitting away with flashes of color when approached. For 25 years I’ve watched summer turning into fall here in the Ozarks. “My Ozark Home” is a look at what I’ve seen. Summer turns into fall here in the Ozarks in much the same way every year. Yet each year is unique. Walking the road is how I see this. 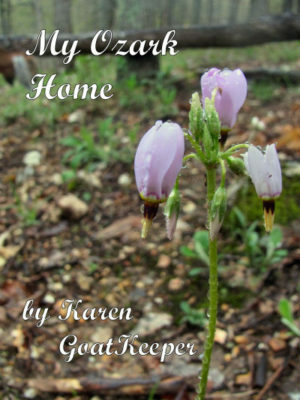 “My Ozark Home” is available as a pdf now. The print book will be available by the end of September. This entry was posted in Ozark Hills and tagged fall in the Ozarks on September 12, 2018 by [email protected]. Lots of times I get so engrossed in taking pictures or scanning plants for flowers, the sudden rustle of a creature darting off startles me. Late summer brings lots of baby lizards rustling the leaves. Both smaller snakes and several kinds of lizards like resting on the sides of the road. The sun warms them. 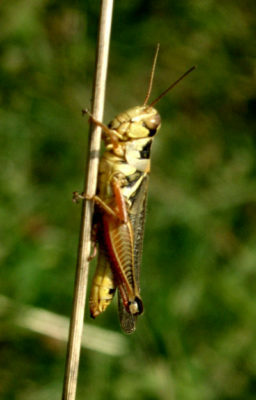 Insects are abundant for snacking. Dangers are at a minimum as passing vehicles frighten larger predators away. I came across this unfortunate mother skink with her eggs while building fence across the creek. I carefully replaced the large stone over her, but the creek flooded about 10 days later washing the nest away. 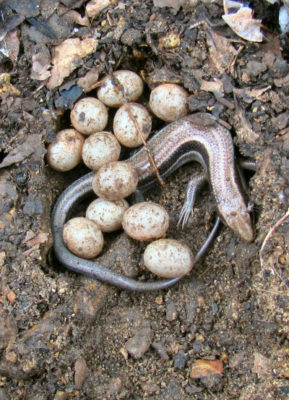 Most reptiles lay eggs leaving them to be warmed by the sun until they hatch. The lizard eggs have recently hatched. Baby lizards seem to be everywhere. A blue tailed skink was curled up in the gate latch hole the other day. The blue tail was bright. It fled when the protecting latch was pulled out as I opened the gate. Common baby lizards in the Ozarks have bright blue tails. As the lizards become adults, the blue tail turns tan. The blue tails mark these as a baby lizards. They get several inches long still sporting the blue tails so many people get the impression the adults have blue tails, are long and lean with bright stripes down their backs. 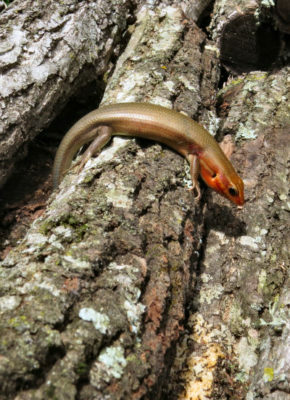 Adult skinks are very different. They are a glistening tan with light brick orange on their heads. Their bodies are thick They do not have blue tails. I rarely see them. 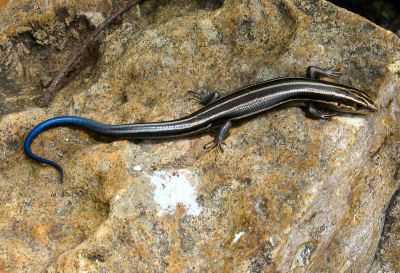 This adult skink is very different from the trim, blue tailed baby it once was. 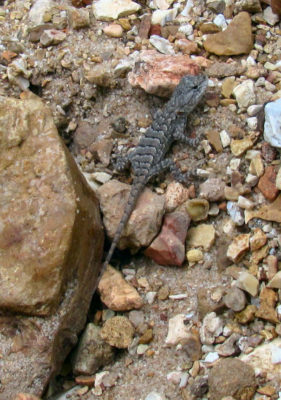 Fence lizard babies look much like small adults. They are the same color and shape, only smaller. And faster. A couple adult fence lizards live in my garden. They have territories and favorite basking spots. One lets me work quite close by without darting off. 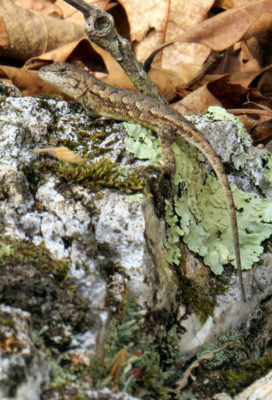 Adult fence lizards are twice as long, thicker bodied and more brown than baby lizards. Several times I’ve come across adult fence lizards out along the creek. They stay still watching me set up the camera and take their picture. I must get within a couple of feet before they dart away. Baby lizards are different. About all I see of most of them is a blur of movement. The sound of rustling leaves is often the only clue they were ever there. Baby fence lizards are a couple of inches long and have sharp markings. 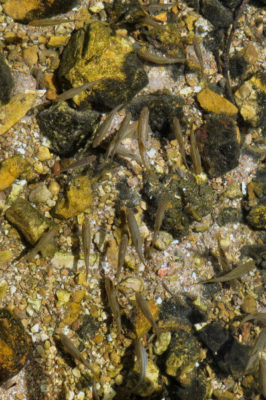 In August these baby lizards seem to be all along the creek and road. I can’t blame them. The world is a dangerous place for baby lizards. Few will escape becoming dinner and make it to adulthood. That makes spotting one staying still long enough for a quick picture a special treat. This entry was posted in Ozark Hills and tagged baby lizards hatch in late summer, Ozarks in August on August 29, 2018 by [email protected]. Most of the plants people are familiar with have flowers of one kind or another. Gardeners love to plant those with big, showy flowers. Tiny flowers are overlooked. My ongoing botany project finds and looks at those tiny flowers. They are proving a great challenge. Spotting these miniscule flowers is difficult. I have to stop and search the plant to find them. 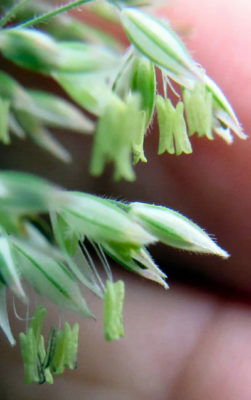 Grasses do have tiny flowers. 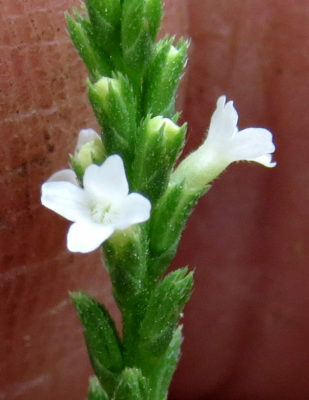 The noticeable ones have rectangular anthers hanging down from the spike of female flowers. Some of these flowers are little more than a pistil and stamens. Those of grasses and sedges are wind pollinated and need no petals. The amaranths are wind pollinated too. 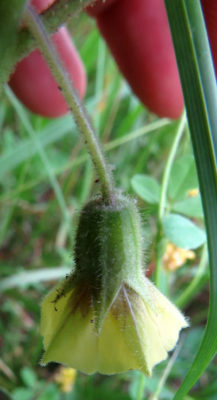 Others have petals or sepals or both. These are tiny, usually white. The entire flower is barely a sixteenth of an inch across. Gnats pollinate these. White verbena flowers are tiny flowers. These appear a few at a time on a tall spike. That made this plant with tiny flowers easier to identify. One of the biggest difficulties with tiny flowers is finding out what their name is. Guide books rarely have tiny flowers in them as most people never notice them. Finding the name is often a matter of luck. Size matters to a camera. For my botany project I take several pictures of each plant. One is of the plant itself. No size problem. The tops and bottoms of the leaves are normally not a problem. These are an inch or more long. Some are thread like so both sides look the same requiring a single picture. This member of the Euphorb family spreads its red stems and opposite green leaves across the ground. The seed pod is the typical one for this family. There are two flowers. The top one has white petals and stamens in it. Just below this one is another with a pistil and no petals. this one will become a fruit with seeds. Stems can be a problem. Some are thin. Others are short. Many are decumbent or flat on the ground. Auto focus prefers gravel, dirt, dead leaves to stems. Tiny flowers are another matter. I need a high resolution, in focus, two inch tall picture of a flower less than an eighth of an inch across. My camera considers this impossible. Notice the seed pod. 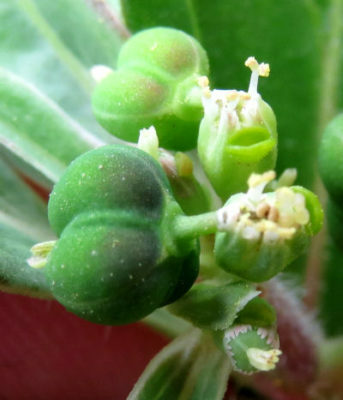 That tags this erect plant as another Euphorb. Both of these flowers are staminate. When it ripens, the seed pod turns brown and stands up straight to shoot out its seeds. Since I want both the front and side to back views of the flower, I have leeway, if I can find two flowers close together and arranged to give both views. This requires careful searching and evaluating of all the flowers on the plant. When such an arrangement is not found, I steady the camera on the ground as close to the flower as I can. Tripods won’t help with this. Then I begin focusing for this picture. Apply a little zoom for a closer picture. Apply a little more for another picture. Repeat this until the camera refuses to focus anymore. Checking the play back for focus is imperative. The final test of success or failure comes on the computer. If one of the pictures meets the criteria, I celebrate. Otherwise I grab the camera and go out to try again. The real success is seeing how pretty these tiny flowers often are. 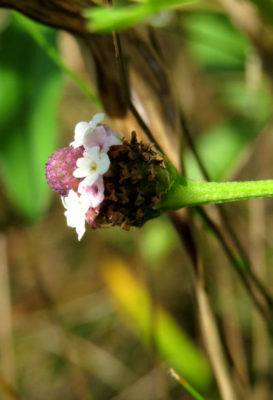 This entry was posted in Ozark Hills and tagged Euphorbaceae flowers, finding and identifying tiny flowers, white verbena on August 1, 2018 by [email protected]. Watching praying mantises is boring after the first few minutes. They sit still or gently sway hanging on a twig or leaf for hours waiting. If an insect happens by, instant action too fast to see occurs. The mantis has a meal. After dining and cleaning up, the mantis resumes waiting. 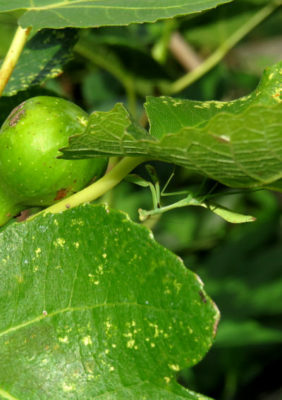 Praying mantises are carnivorous insects. Their heads are triangles with large eyes on two points and a mouth on the low point. They have good eyesight watching you watching them. There are times watching praying mantises is interesting. One time is when the big female lays her eggs in the fall. 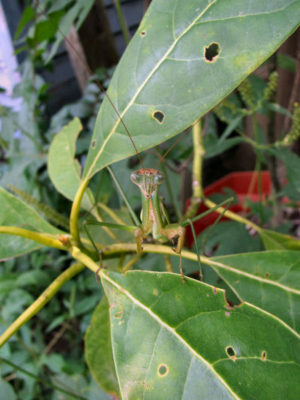 The most obvious mantises around the place are Chinese mantises imported by gardeners for insect control. 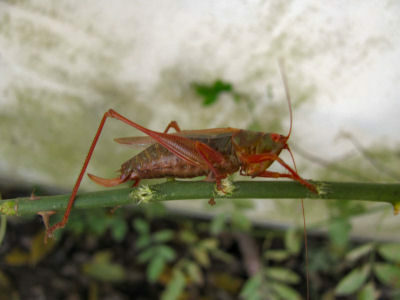 The females get six or seven inches long. All mantises die in the fall. The next generation is encased in what looks like a piece of tan foam attached to a branch or stalk. The favored ones here are the bamboo and the sumac. Blackberry canes will do. 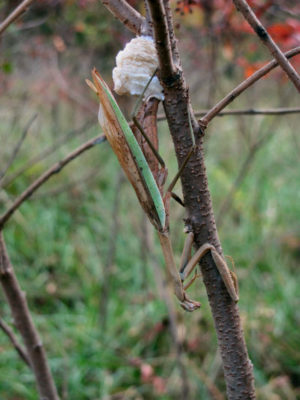 A female praying mantis shoots out her eggs encased in foam layer by layer. She moves slowly down the stalk for each succeeding layer. The female faces the ground and starts shooting out liquid that bubbles up and hardens into foam. Eggs are hidden in the foam. Spring brings the next interesting time for watching praying mantises. The eggs hatch once spring warms up. The half inch long miniature mantises emerge one by one moving quickly away from the case. Each has a bit of yolk left from the egg. It doesn’t last long and baby mantises are not picky eaters, even eating siblings. 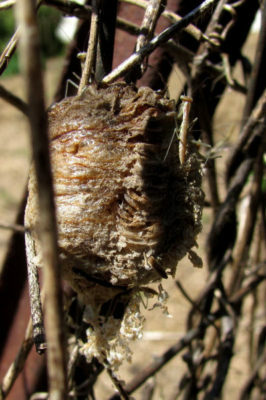 Dozens of baby praying mantises crawl out of the egg case once spring warms up. They quickly scatter. As the baby mantises grow, they molt. Each time they get bigger. On their final molt they emerge with wings. 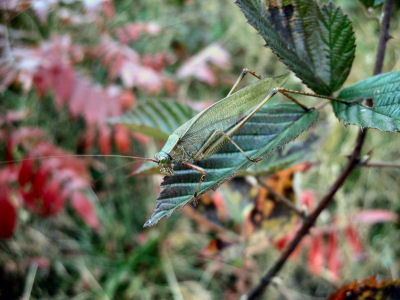 People make a big deal out of female mantises eating their mates. It isn’t really. The male mantis who survives mating will die within a week. If eaten, his protein helps make his eggs more numerous and able to produce stronger babies in the spring. Within a month a praying mantis doubles or triples in size. This one is hiding on a potted fig tree waiting for dinner to happen by. 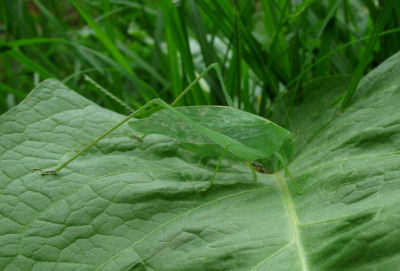 Smaller mantises are the same green as the plants they sit on. Spotting them is a lucky chance. I enjoy seeing them, glad they are busy munching on bugs I would rather not have around. Watching praying mantises is still boring over the summer. This entry was posted in Ozark Hills and tagged gardening, insect control, praying mantises on July 18, 2018 by [email protected]. Milkweeds have this white, sticky sap filled with an unpleasant tasting chemical. They are listed as toxic to livestock. Milkweed Tussock Moth caterpillars don’t care. 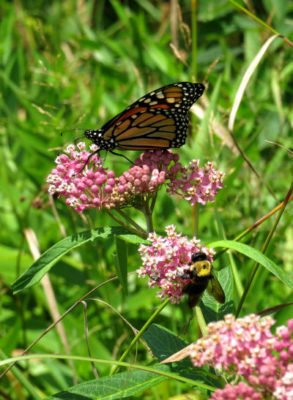 The bigger Missouri milkweeds (Common, Purple, Swamp, Butterfly Weed) are eaten by various livestock including cattle and goats with no ill effects. Deer eat them too. A famous consumer of milkweeds is the Monarch Butterfly caterpillar. The decline in Monarch populations has led to a push to plant milkweeds even as state and local road crews continue to mow them down in ditches statewide. This Common Milkweed colony seems to migrate every year. This year it occupied a main path between the barn and the hand water pump. 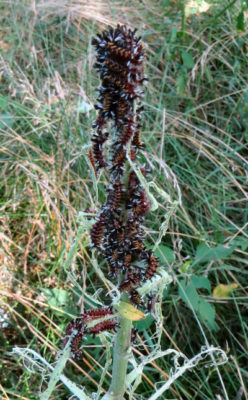 I was skirting around the coloy when I spotted the army of Milkweed Tussock Moth caterpillars on one stalk. Such caterpillar armies are very impressive and several kinds of caterpillars form them. Several colonies of Common Milkweed, Asclepias syriaca, grow around our house and barn. These plants do put out root runners and shoots forming colonies of a few to a forest of stalks. The Milkweed Tussock Moth population has discovered them. Adult moths have bland, tannish wings spreading one to two inches across. 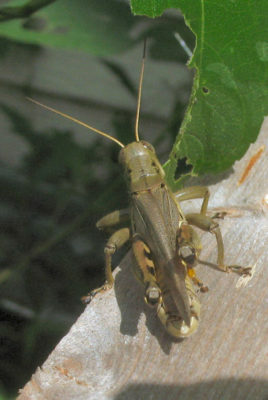 Their abdomens are yellowish with a line of black spots down the center back. These are easy to overlook unless you are a chicken. The caterpillars are not easy to overlook for a couple of reasons. Milkweed Tussock Moth caterpillars are easy to identify with their brightly colored hair tufts. They get about two inches long before using the hairs to make a cocoon to pupate in. Fall caterpillars overwinter in the cocoons. 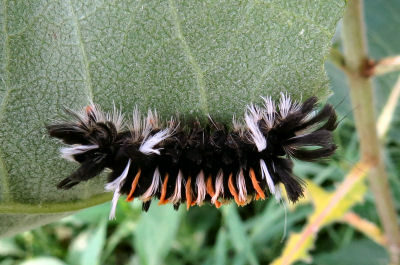 First the caterpillars are covered with stiff tufts of yellow, black and white hairs. 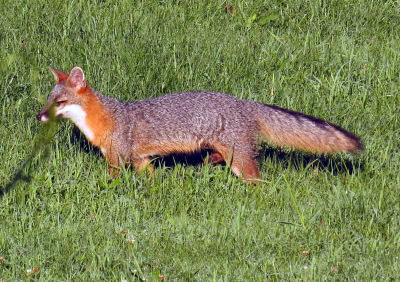 The tufts on the head and tail ends are long. The ones in the middle are short. Second is the sheer numbers of caterpillars. Larger ones do tend to be more solitary. Smaller ones form armies thirty to fifty strong. 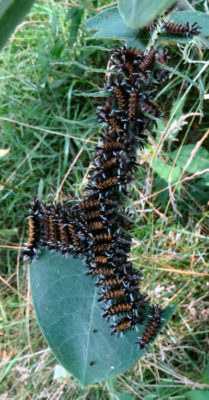 One such army attacked a Common Milkweed stalk about three feet tall, lined with large leaves. The leaves vanished quickly. The horde then surrounded the top of the stalk and began consuming it until only a few inches was left. Once the leaves are eaten, the Milkweed Tussock Moth caterpillar army consumes the stalk. There are so many caterpillars the stalk isn’t visible. 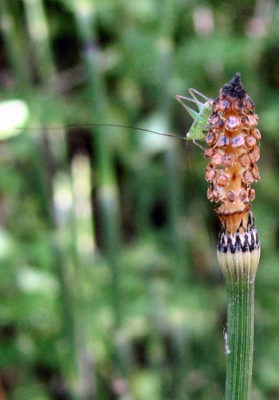 The army moved onto a neighboring stalk. By the next day the Milkweed Tussock armies had marched on to other places. Scattered caterpillars still worked on a few plants. The Monarchs will be moving through again heading south in another month or so. Then the remaining leaves will vanish down the gullets of Monarch Butterfly caterpillars. This entry was posted in Ozark Hills and tagged caterpillar armies, Common Milkweed, Milkweed Tussock Moth caterpillars, tufted caterpillars on July 11, 2018 by [email protected]. Ground cherry is like the husk tomatoes sold to gardeners. It, like tomatoes, potatoes, peppers and nightshade, are members of Solanaceae called the Nightshade Family. I saw these plants out in the pasture and along the road buried in the grass. The horse nettle, a relative, stands taller showing off its half inch spikes. 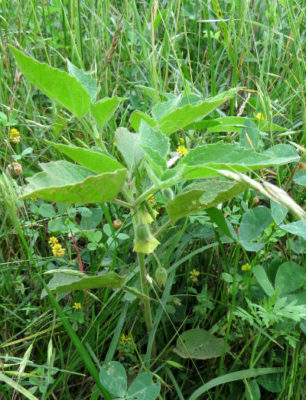 Downy ground cherry plants are about a foot tall hidden among pasture grasses. Naively I thought there was one ground cherry and one horse nettle. In the case of horse nettle I was correct. Dent County is home to three ground cherries, possibly two more. I went back to my photographs from past years. I read the descriptions. I looked at the pictures again. Downy ground cherry flowers hang down opening toward the ground. Yes, some of the plants did look different from the others. It was hard to tell. And the plants were mixed making telling them apart even harder. 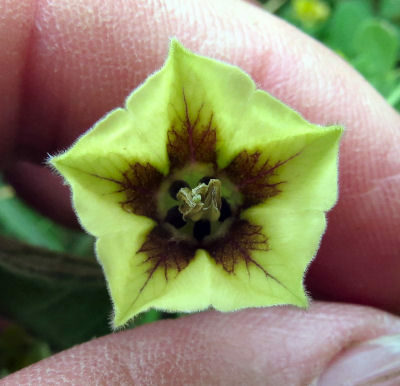 Ground cherry flowers are bells with five points. There is no quick fix. I get to start over tracking down these plants and taking a new set of photographs. This time I know there are up to five kinds of ground cherries. I will again look pictures of them up on the internet. I will make closer observations of the plants as I find them. The downy ground cherry leaf has wavy edges. It is covered with fine, short hair. Finding the plants will take time. Some of these plants do reach eighteen inches tall. The grass is two feet tall. Invariably the goats are my best allies. The herd doesn’t like the tall grass and hopes the brush hog will trim it down to size soon. They tromp out and wait for me to come out and lead them back through that scary grass where some monster must be hiding. Like other ground cherries, the downy puts its round fruit inside a thin, papery bag. When the fruit is ripe, the bag dries and turns brown. Of course I often go out without my camera. It is late afternoon, not the best light for taking pictures. And I find a patch of ground cherries. The first patch was easy. It was the first and not a repeat of one found earlier. The challenge was finding the patch the next day. I didn’t. I finally did find the patch again. One down, four to go. This entry was posted in Ozark Hills and tagged downy ground cherry, Ground cherry on July 4, 2018 by [email protected]. Normally choosing covers for a book takes lots of time. Sometimes I try out numerous ideas. As “My Ozark Home” neared completion, the question of covers became important. In truth, I chose the front cover as I was picking out the pictures for “My Ozark Home.” It was a favorite photograph I’d taken a few years ago. A misty rain left tiny drops on this dandelion seed head. The sun sparkled on them making the sight special. I was experimenting with my camera, trying to expand my picture range. One morning had a light rain falling. The rain stopped about noon. Digital cameras are full of electrical circuits that can’t get wet. The circuits will short out and ruin the camera. I still wanted to take a few pictures of plants with rain drops on them. 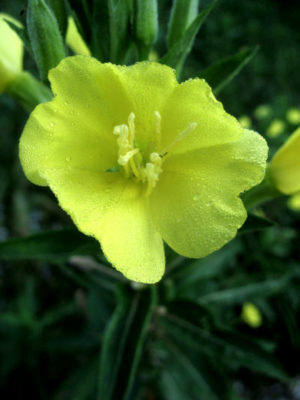 Early in the morning, before the sun is full on the garden, the evening primrose blossoms glow lemon yellow splashed with dew. Perhaps this picture will grace another book cover in the future. Packing a couple of plastic bags in a back pocket, I set out in boots. Wet feet are not my style. I headed up the hill over the hill pasture following the goat trail across the hill, across a couple of ravines and up to the crest of the hill. Along the way I found several plants in bloom including a shooting star. The pictures were lovely and extra. Wildflower pictures aren’t taken with rain drops on the flowers. The pictures languished in a file on my computer. Why choose this photograph for the front cover? First is the image of the shooting star, a lovely wildflower, trimmed with tiny rain drops. Second is the sweep of the hill behind the flowers. Third is the placement allowing room for the title and author without ruining the flower. Most important is that this is a favorite photograph I am happy to finally find a way to share. This book was a wonderful way to use some of these extra pictures. The shooting star moved to the book file along with a mental note to use it for the front cover. A book has two covers. I had no idea what to use on the back cover. None of the pictures in the book seemed right. I went back to the picture files. The south pasture has a lovely vista. I’d used one picture of it in high summer with the grass tall, lush and green. There was another picture of the pasture in early spring, before the grass was lush and green. This picture wasn’t part of the book. The front cover picture was. The back cover picture should be. Except I couldn’t add one picture. I had to add two. I found another and the two went into the book. And the south pasture became the back cover. “My Ozark Home” now had its two covers. Although “My Ozark Home” will not be available until July 7, you can read some sample pages now on the My Ozark Home page. This entry was posted in Ozark Hills and tagged "My Ozark Home", taking nature photographs, wildflowers in the rain on June 27, 2018 by [email protected]. Ranchers don’t appreciate summer clouds during hay season. That changes once the hay crop is baled and inside. Rain is welcome then to start the grass growing for a second cutting. Unlike the gray cloud blankets of the winter months, summer clouds are billowing piles of fluff. Hot, humid summer air rises up until it hits cool air. Then the humidity’s water vapor condenses into water droplets. This gives summer clouds their flat bottoms at the height where the moisture appears as specks of droplets. Puffy cumulus clouds strut their way across blue skies. These are fun to watch as they change shape blown apart, then back together by the wind aloft. Somewhere they may pile up into thunderheads, but not here. The warm air continues to rise carrying the water droplets with it to create the piles. Wind tosses these water billows around to make pictures in the clouds. Children will say a cloud is white. The parts in the sunshine are white. The rest is shaded. Light shade is light bluish gray. Deep shade can leave a cloud black. Glowing golden in the sunset these wispy clouds could be a pteridactyl flying across the sky. Earlier it was a dragon. 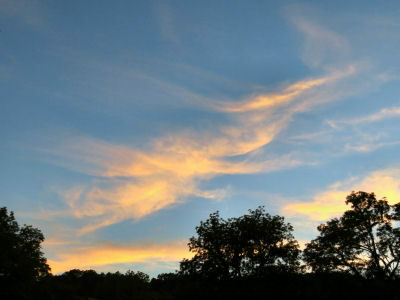 Summer clouds often form pictures in the Ozark sky. Late in the day these summer clouds can hold hues of yellow, pink and red, then becoming deepening shades of purple as night overtakes day. Looking through my pictures for “My Ozark Home” I found many of them had summer clouds in them. These range from benign puffs dotting an intensely blue sky to towering thunderheads threatening stormy weather. The ever changing clouds with their shifting patterns of grays and blues catch and hold the eyes. Dragons, rabbits, snakes, people and more march across the sky morphing from one to another as they go. These summer clouds are towering to great heights leaving their bottoms dark, soon to be black. These herald a thunderstorm. Then a curtain of dark blue will stretch to the ground. This is the rain falling. Clouds are part of several sections in “My Ozark Home” including those on storms and floods. Summer clouds are an inescapable part of life in the Ozarks. The problem clouds are the ones coming over the southwestern hill advancing toward the house rumbling and grumbling to themselves. 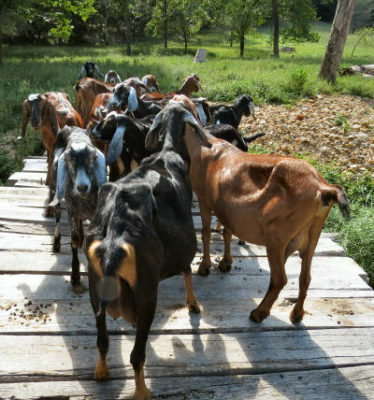 That makes it time to bring the goats in and put things away. 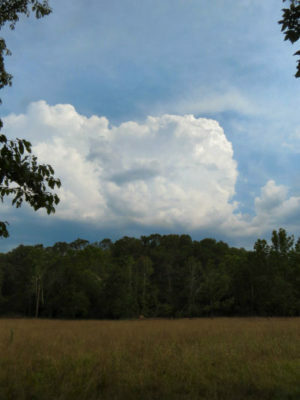 This entry was posted in Ozark Hills and tagged cumulus clouds, Ozark summer, thunderheads on June 20, 2018 by [email protected]. Patience is difficult. My book “My Ozark Home” is nearly complete. A few more pictures are missing. And I have to wait. There’s an old saying: A watched pot never boils. Well, a watched plant never seems to bloom. Over the years I took pictures of my road in all seasons except one: summer. I took lots of close ups of the plants, but not the road. The book needs one of the road. 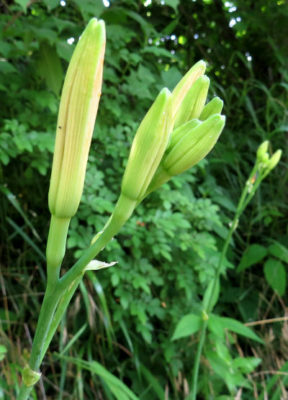 How long does it take for a daylily to bloom? These buds have been about this size for a week! Summer has lots of greenery. It’s short on color. There are flowers like daisy fleabane and Deptford pink blooming, but they are small. Orange daylilies are a big splash of color. There are several patches of these plants along the road. They bloom in early summer. Except this year. This year I’m waiting for them to bloom. The buds formed. They get bigger, slowly. I wait. The daylilies on adjacent roads are blooming. The daylilies in the backyard are blooming. In the meantime I’m editing. The written parts of the book are done. The pictures I have are in. The haikus are there, most of them. At last! The buds are getting tall and showing orange. The tallest one will bloom tomorrow morning. It would be nice to have several buds open the same morning. Please? Next come the page numbers. These take planning in a book like this one. Odd numbered pages are on the right. Even numbered pages are on the left. This is important to remember. The Table of Contents must be on an odd numbered page. That was easy. It’s on page three. Page one is the title page. Page two is the copyright page. There are ten written pages. I want each to be on an odd numbered page with the first photograph of that section on the facing even numbered page. That leaves the previous section ending on an odd numbered page. That sounds simple. Until a section ends on an even numbered page. Maybe this picture will do. The road is a bit overgrown as the brushcutter hasn’t been by in two years. With good weather and lots of rain, the plants grow fast anyway. finally some of the daylilies are blooming. Only some of the buds open each morning. There are now two choices. I can eliminate one of the photographs in the section. I can add another photograph and haiku to the section. The second choice is preferable. Back to the piles of photographs to find the one that will fit into the section. Of course, putting a new page or rearranging pages means the page numbers must be adjusted. So much for this being a simple book to complete. I think I will go out and look at the daylilies again. I do need more pictures to complicate my editing. 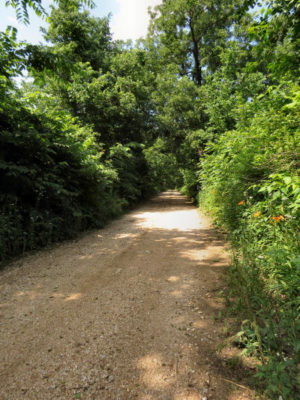 This entry was posted in Ozark Hills and tagged "My Ozark Home", country roads, Ozarks, pictures, seasons on June 13, 2018 by [email protected]. Much as I enjoy hiking my own Ozark hills, Missouri has many lovely places to enjoy. ShawneeMac Lakes Conservation Area is one. This area once belonged to a family named Ziske. They put up two earthen dams creating two fishing lakes. Old timers still call them Ziske Lakes. 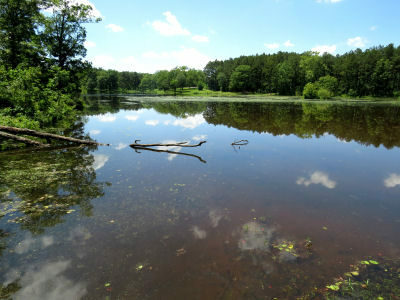 The upper lake at ShawneeMac Lakes Conservation Area stretches back into the woods where several streams feed the lakes. Now the lakes are a Missouri conservation area. Fisherman come to fish from the banks or drift along in boats. Only electric motors are allowed. I find many plants along the lake shores such as flax, swamp milkweed, common alder and Meadow Beauty. Water shield grows in the upper lake. Ducks and geese come by for a time, then move on. Looking across the lower lake at ShawneeMac Lakes Conservation Area from the trail, a bench and boat ramp access are visible on the far shore. The lake shores are mowed. Picnic tables and benches are scattered around. A floating gazebo is a popular place for larger groups. ShawneeMac Lakes Conservation Area is only open during the day. A nature trail goes around the lakes. Tall shortleaf pines shade the trail. It is a yard wide and graveled. It winds along the edge of the both lakes. Sturdy wooden bridges span the streams and end of the lake as part of the trail going around the lakes. The trail is shaded all the way around. Wooden bridges span incoming creeks. Monkey flowers bloom below some. Gayflower blooms near the lake. False Solomon Seal, American holly, Carolina buckthorn and more grow along the trail. When time or energy is limited, a trail branches off crossing the first dam. It goes back to the second parking area near the gazebo. The main trail continues on. 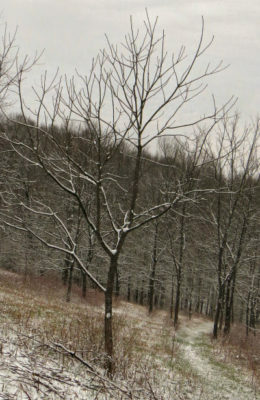 A branch loop takes off onto higher ground. 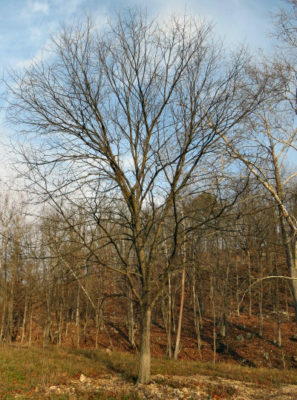 The trees are mostly hickories and oaks – white, black, post and blackjack. 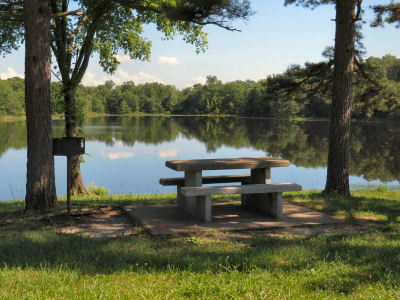 Two picnic areas with tables and grills overlook the upper lake at ShawneeMac Lakes Conservation Area. 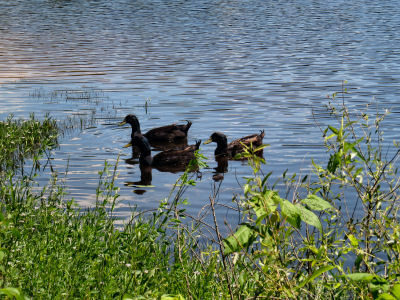 When no one is around, the view is relaxing with the breeze sifting through the shortleaf pines and calls from the ducks and geese that visit the lakes. The loop comes back into the main trail just before it crosses the second dam. The lake side is covered with large rocks. Alder, hop tree, swamp milkweed, bittersweet and bent pod milkweed hide the rocks. The other side is a long, dirt slope. Asters, grasses, common and butterfly weed milkweeds and sunflowers cover the slope. A new flock of ducks on the lakes at ShawneeMac are real moochers. They swim ove to check out any visitor in hopes of tidbits tossed their ways. 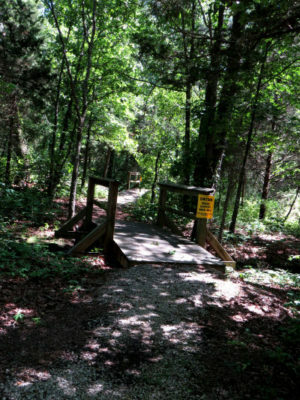 The trail climbs a hill to an archery range and back down to the lake shore. This side of the lake shore is thick with multiflora and pasture rose bushes. Passion vine drapes itself over the bushes. After two and a half miles, the trail climbs up a hill past a field of common milkweed and a second field scattered with rattlesnake master. It comes back to the second parking area. Hiking the trail at ShawneeMac Lakes Conservation Area is relaxing. The trail is often empty of people leaving the forest fairly quiet even though people live close around the area. 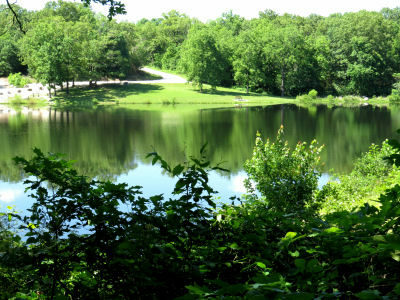 Missouri is lucky to have so many wonderful conservation areas. This entry was posted in Ozark Hills and tagged hiking, Ozarks trail, ShawneeMac Lakes Conservation Area on June 6, 2018 by [email protected]. March in the Ozarks was cold. Wild plants tried to grow. Pursuing plants was simple as so few were blooming. April hinted at spring then sprang into summer. Trees leafed out overnight. Spring wildflowers were buried under rampant summer growth. Pursuing plants became a hopeless task. I’ve seen this Gallium or bedstraw before but dismissed it as an old weed. This year I took a closer look and found a new plant. There are ten members of the Gallium group in Dent county. I have now completed two and started two more. And there is another I think I have overlooked. 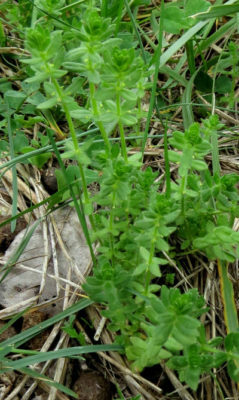 This six inch tall, multi-stemmed plant called Yellow Bedstraw grows in sunny pasture or other grassy places. Still, the botany project continues. That elusive goal of 2000 plants could be on the moon. This year the goal is to make 400. Over 200 plant picture arrays were completed last year. Many others are missing one or two pictures. Some of the ones for this year will be trees. Pursuing plants takes more time than I can spare. The secret is to carry the camera whenever I go out for any reason. So many plants have one or two pictures missing. This Monarda often called Horsemint was missing a picture of the plant. this can be difficult to get as it prefers shady areas and is hidden by other plants. A goat kid gets lost? Take the camera. Find the goat and take a couple of dozen plant pictures. Fences need checking or fixing? Take the camera. There are plenty of wild plants on the trek out, around the fence and on the trek in. Taking a slightly different route helps too. Violets are blue, or so the saying goes. Violets come in several colors including green. This is a green violet. The plant is easy to spot. the flowers are small and hang from the stalk like little green earrings. One more picture of the fruit will complete this plant’s picture array. This year’s plan is to take one day a week to go out pursuing plants. There are two conservation areas and a state park close enough to make day trips. To date those plans are on hold. I’m ready. The weather isn’t. It keeps raining on the day I want to go hiking. Digital cameras hate the rain. The weather has been frustrating. I find a plant, take pictures of it in bloom and estimate when to come back to get a seed pod picture. It rains. Next year’s list now has three plants and two trees on it. As a child I learned about plants with leaves in threes: poison ivy and poison oak. The leaves of fragrant sumac look a lot like poison oak, but don’t leave you wishing you’d never met. The yellow flowers are followed by red berries. There is one other ploy I must add to my plans. Next year I will have stakes to mark where smaller plants are. Wild pinks are so bright, so vivid, they can’t be missed. The plants are small and easily overwhelmed by taller ones. I missed the seed pods. Another challenge is coming: the brush cutter. My road is too overgrown and must be cut. This is the worst possible time, but it will come anyway. I have at least two plants to mark so the brush cutter will leave them. Pursuing plants may be a bigger project than I can ever complete. The pursuit is the true goal. 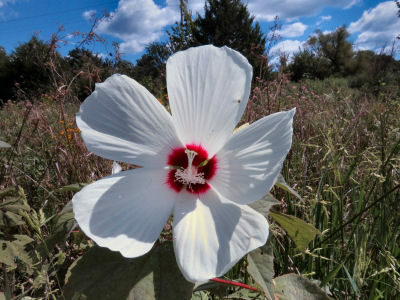 Many plants are included in Exploring the Ozark Hills. Check out the sample pages. 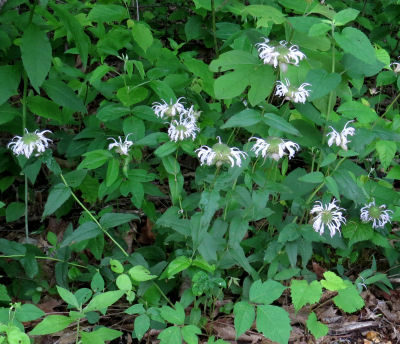 This entry was posted in Ozark Hills and tagged Bedstraw, botany, fragrant sumac, green violet, horsemint, Ozarks, plants, wild plants on May 30, 2018 by [email protected]. Ravines are not good places to be during high water. Afterwards, when the water is shallow again, is another story. Then ravines can be special places. After starting cleaning up after the flood, I went walking up a ravine I rarely go into. It’s overgrown, has steep sides and begins far up a hill, coming out behind the backyard. 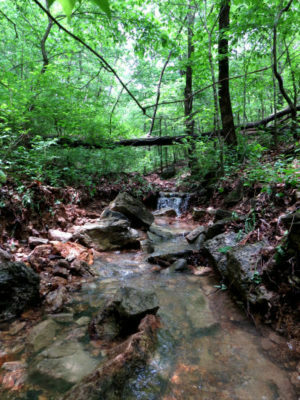 Blocks of rock create eddies and waterfalls a foot high in parts of this Ozark ravine. Water flows through parts of this ravine much of the year. 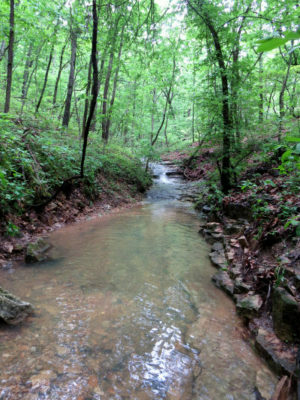 Seeps and small springs are dotted along a left branch of the ravine. Last winter I found the water had frozen into a foot thick sheet of ice. It found its way into The Carduan Chronicles. This is long gone, as are the bare branches and barren leaf litter. Water tumbled down over rock ledges. It spread out into moving sheets in wide areas of bare rock. It eddied in long, foot deep ponds patrolled by water striders. Ozark trees are decked out in summer finery now. Spring ephemeral wildflowers are setting seeds and vanishing. Summer wildflowers aren’t blooming yet. Quiet and green hillsides are restful vistas. Liverwort covered some rocks near the seeps. Christmas ferns lined folds in the hill rising to the south of the ravine. Trees decked out in spring green leaves lined the hillsides on both sides. This excursion into the ravine was done in rubber boots. Boots are a must with water running across and over the road, standing in pools in the pastures and with the bridge needing repairs necessitating standing in the creek. Pools over a foot deep form in places in this ravine. Last winter this pool was a sheet of ice. Now it is a skating rink for waterstriders. The rock shelf along the side makes it passable for me wearing rubber boots. Boots made walking up the ravine easy. I stayed in the water course striding up the shallow areas with cool water swirling around my feet, stepping up the small waterfalls and edging around the pools. Half way up the ravine, it splits. The side to the left is narrow, lined with seeps and wet rock ledges three to six feet high. It goes up a deep fold in the side of the hill. Tiered sheets of rock form the floor of this ravine. Flowing water is a shimmering sheet dropping down the tiers. The branch to the right is broader with gravel across its floor. This side is dry except after a rain. It runs between two hills. I ventured a short way up the branches, then turned to return the way I had come. Walking in ravines with water flowing is relaxing as the wind rustles the leaves overhead and the tumbling, gurgling and splashing water flows by. This is one of the ravines I’m using for ideas for The Carduan Chronicles due out this fall. Pictures of it are in “My Ozark Home” due out this summer. This entry was posted in Ozark Hills and tagged high water and floods, Ozarks, waterfalls in ravines on May 23, 2018 by [email protected]. Over the last twenty-five years the bird populations have changed a lot. Another new resident arrived this year: Baltimore Orioles. Baltimore Orioles are bright orange with orange outer tail feathers. They are summer residents in the Ozarks. This one likes the large hummingbird feeder. There weren’t many birds here when we moved in. A handful of hummingbirds came by the feeder we set out. Cardinals came for sunflower seeds in the winter. Mourning doves moved in. Blue jays mobbed the feeder. Now watching the action outside is exciting. The bird guidebook has moved onto the kitchen table. This year indigo buntings, brown thrashers, downy and red-bellied woodpeckers, chickadees, titmice, cardinals, blue jays, mourning doves, rose breasted grosbeaks, red winged blackbirds, various sparrows and warblers take turns gobbling the sunflower seeds. We’ve added scratch feed and peanut butter to the menu. The feeder too has changed. Originally it was a platform with two five gallon buckets holding up another platform as a roof. Now the platform is smaller with a wood structure and tin roof protecting it from rain and snow. 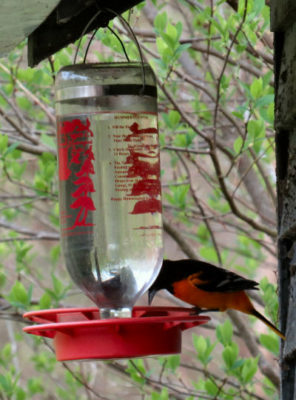 Four pairs of Baltimore Orioles like the hummingbird feeder. They do not like to share. 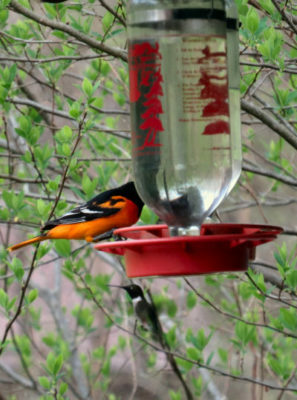 The second oriole had to move to the second feeder. The hummingbird feeder has changed too. The first held a pint and lasted several days. Now, by late summer, five quart feeders empty daily. Last year a pair of orchard orioles discovered the sugary treat. It enticed them to stay and nest in the sugar maple in the front yard. This year the Baltimore Orioles arrived. The first hummingbirds had arrived a few days earlier. They were not impressed with the giants now sitting on their feeder. A second feeder went up so the oriole could eat at one and the hummingbirds at the other. Then another oriole arrived. 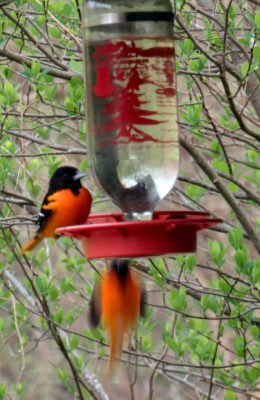 Every morning four pairs of Baltimore Orioles take turns enjoying both the hummingbird feeder and the sunflower seeds. The hummingbirds hover unhappily until the orioles leave. Hummingbirds get chased off by the Baltimore Orioles. Since the orioles sleep late, the hummingbirds mob the feeders early. The orioles often arrive singly taking over one feeder and leaving the others to the hummingbirds. Unlike the orioles, the hummingbirds often sit six or eight at a time on a feeder. Each hummingbird feeder has eight stations. All eight on both fill up with birds drinking as fast as they can. When these two feeders empty in a day, another feeder will go up. Otherwise we watch and put it up when the hovering cloud is as big as the feeder customers. The Baltimore Orioles have been here over a week now. They seem to be taking a look around. We hope they build nests like the orchard oriole which has returned again this year. 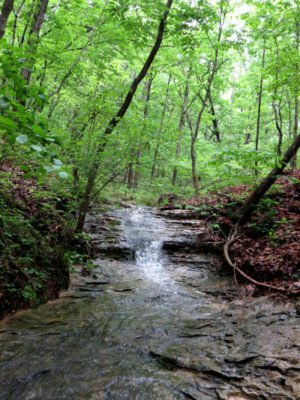 Enjoy more about an Ozark spring in Exploring the Ozark Hills. This entry was posted in Ozark Hills and tagged Baltimore Orioles, feeding wild birds, hummingbird feeding on May 9, 2018 by [email protected]. 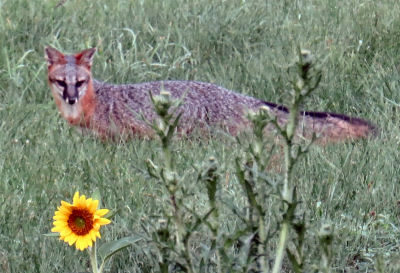 Warm weather is pouncing into the Ozarks. 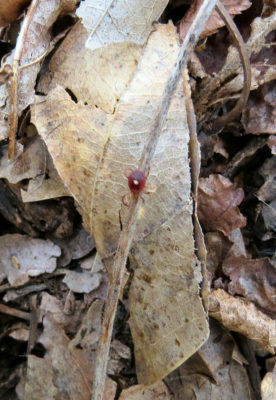 Hints of warm weather bring out the lone star ticks. A lone star tick gets its common name because of a single white spot on the back of the adults. These are the common ticks in the Ozarks spring to late summer. The cool weather did bring out a few ticks. A tick here. Another there. Enough to be annoying, but not a problem. The white dot marks this as a lone star tick. It clambered over rocks, leaves, twigs and ground is a frantic attempt to reach me. That changes with warm weather. Armies of ticks are out in force. Although ticks are common out in the woods, they aren’t easily seen even when you look for them. Many are immature and a bare sixteenth of an inch across. Even the adults are less than a quarter inch across. I met up with an adult lone star tick in the woods. The pussytoes are in bloom and I wanted a picture of some. Since pussytoes are less than six inches tall, I sat down to get the camera down for a picture. This audacious lone star tick started racing over toward me. This tiny creature was eighteen inches away. How could it know I was there? This was one determined tick. I shoved the leaf or twig it was on back a foot. Still the tick raced over towards me. It was amazingly fast leaving most of my photographs blurry. I tossed it over a few inches. It immediately began racing toward me again. After two or three times of tossing this tick aside and having it still race toward me, I knew it was homing in on me somehow. Mosquitoes use carbon dioxide and heat. What was the tick using? The beacon had to be heat. I find ticks prefer warmer areas on the goats so it must be heat. Once a goat is bitten, the area reddens heating up and becomes a tick magnet. One thing for sure, this tick had to be extremely sensitive to heat to notice the slight increase from me over eighteen inches. Unfortunately for the tick, it was rushing to execution. I have zero tolerance for ticks. The insect repellent is coming out of the closet. Soapy water and chickens are even better as the ticks die. 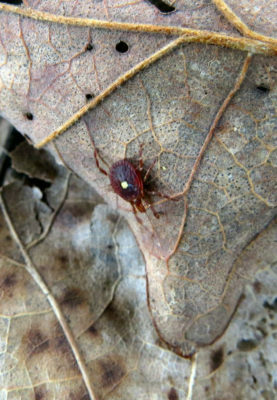 This entry was posted in Ozark Hills and tagged lone star ticks, Ozarks, ticks appear in warm weather on May 2, 2018 by [email protected]. Growing up in southern California, I picked up lots of shells at the beach. I amassed a large collection of about 1000 species, all identified. Collecting shells is a thing of the past now. That isn’t because there are no shells to be found in Missouri. I’ve moved on to other interests. Still, seeing a shell is special. 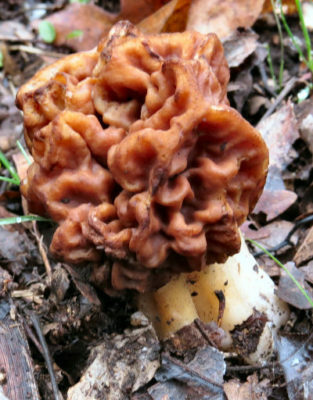 The top of a red morel is much brighter than this old specimen shows. It was about 4 inches tall, medium sized for a red morel. The other day I went out seeking a red morel mushroom spotted in the ravine the day before. I’d never seen one before. The red morel wasn’t red and was getting soft on this second day. It was the only one. A little further up the ravine was a single morel. 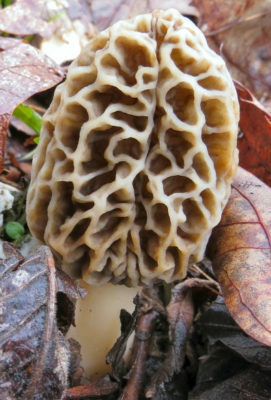 The commonly thought of morel is tall with a pitted top. The center of the top and stalk are hollow. They are a popular dining area for insects and snails and must be washed carefully before cooking. People talk about finding morels in the woods. They bring home bags of them, enough to share with friends. This property seems to be a morel desert. The biggest group ever found was a mere couple of dozen. This was one year and never repeated. Missing the morels is a disappointment as they are very tasty. Still, the chanterelles in early summer are delicious as well and they grow here in abundance. Snail shells are tight coils. The original shell would be at the very center but is often, as it is on this shell, gone. The body is ridged. The foot has a thin margin. Near the morel I spotted a snail. Usually these mollusks vanish into their shells as soon as they spot me. This one ignored me and glided along on a dead oak leaf. 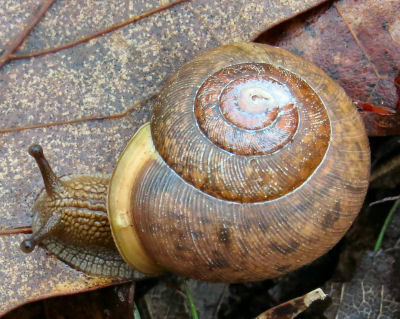 Snails and slugs, both gastropods, are nuisances in the garden. I toss them over by the creek. Out in the ravine the snail was no problem, so I settled in to watch it for a few minutes. Gastropod means stomach foot. A snail fits this as its foot glides along on a slime trail it lays down. Its stomach sits on top of the foot and tucked into it’s shell. Snails put out four projections from their heads. The top two have eye spots on them. The bottom two test the ground before the snail glides onto it. The shell has many tiny ridges or growth rings on it. The shell is created a layer at a time. It is slightly convex. The shell is a spiral. The baby snail makes a tiny shell. 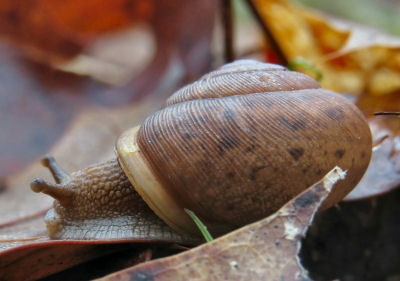 As the snail grows, it adds to the edge of the shell making the coil larger in length and diameter. When threatened or staying dormant, the snail retreats into its shell. Over the winter the snail excretes a film sealing its shell with it safe inside protected from winter’s fury. Land shells are usually plain. They have no bright colors or spines. They are still a marvel of delicate architecture worth admiring. The Ozarks is a biologically rich area. Read more about the Ozarks in Exploring the Ozark Hills. My shell collection along with the identification books and field notebooks is available to anyone who can make use of it. I collected until 1972 mostly on the west coast, but in Baja, on the east and gulf coasts plus purchased some. I used it for teaching and have echinoderm tests, corals and sponges in the collection as well. If you are interested, please email me through the contact page. This entry was posted in Ozark Hills and tagged land shells, morels, shells, snails on April 25, 2018 by [email protected]. Calendars don’t accommodate weather. This is a cold, wet, wintry spring. A few days lure plants and animals into spring. The next day sends them scurrying back to hide. But turkey season is still on the calendar. Like all the other creatures, turkeys have been trying to greet spring. For tom turkeys this means putting on displays and gobbling. For hen turkeys this means finding nesting sites and hanging out with the toms. 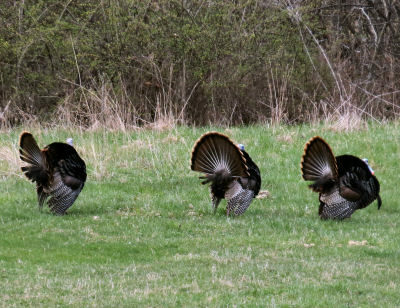 During the fall groups of tom turkeys forage for grass seed in relative harmony. In the spring these same toms are rivals competing for hens. Usually gobbling is audible much of the day. Turkeys parade across the hill pasture easily watched from the house. This year gobbling is an early morning sound, if the weather is warmer, like forty degrees. Otherwise the turkeys stay up in the woods scratching for leftover acorns and plants growing in spite of the frosts. Turkey season for hunters is in April. Toms have been gobbling for a few weeks. Hens are busy laying eggs in their nests. This year turkey season is still in April. But the toms are still getting started. Only tom turkeys are hunted in the spring. During most of the year, tom turkeys keep their feathers down and aren’t much bigger than the hens letting them slip away from sight. Spring brings on the displays with tails raised and spread, feathers standing up, wings spread into fans. This is hard to miss from quite a distance away. However, wild turkeys are still wary birds and impossible to approach in the open. There are a lot of turkeys around my hills. There is a north pasture bunch. The hill pasture bunch is the one I usually hear and see. Another bunch is in the south pasture. Next door is a huge bunch. The bunches on my hills haven’t been hunted in years. I don’t hunt due to time and lack of skill. The neighbors love deer hunting, but don’t do much about the turkeys. The family who hunts deer on the place don’t hunt turkeys. So the turkey population continues to go up. Like all natural populations, turkeys die for lots of reasons. Coyotes catch them. In bad acorn years, many starve to death. Poults get picked off by coyotes and hawks. There are still enough turkeys for a hunter to enjoy wild turkey dinner. And this year a hunter has asked to visit these hills for turkey season. Find more about turkeys in Exploring the Ozark Hills. 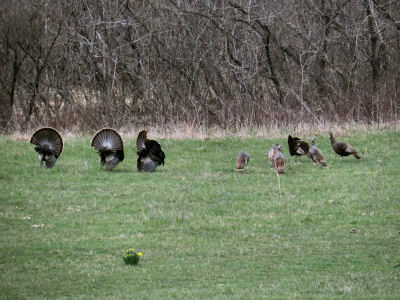 This entry was posted in Ozark Hills and tagged Ozarks, turkey season, wild turkeys on April 18, 2018 by [email protected]. April is a few weeks into official spring. Wildflowers are starting to bloom. April snows arrived anyway. The day was too warm for snow. The clouds were snow clouds. What makes a cloud a snow cloud? It has that dark gray color yet is thin enough for the sun’s disk to be visible. A few days of warm weather has the tree buds swelling. 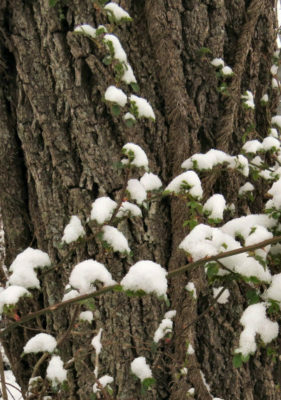 April snows cling to the branches and trunks of the trees belying the spring promises. Still, the temperature rose from a chilly twenty-four to forty. Much too warm for snow. The temperature began to drop, settling at thirty-five. Still too warm for snow. But the snow fell, an inch of it. April snows are wet snows. The temperatures are too warm so the flakes are almost melting as they fall. The ground was still frozen, so the snow chilled and stayed. April snows are pretty snows. Wet snows stick to things. It lines the branches. It forms patches on rough tree bark. It makes little hats on bushes and fence posts. Buckbrush leaves were already spreading out. Now the leaves hold snow caps. April snows are not welcome snows. Deer have been gorging on fresh spring grass, now buried. Tree buds have been swelling. Leaves are impatient to spread out and catch warm rays from the spring sun. Birds have been singing, marking out nesting territories. They now sit huddled on cold, snowy branches. The insects are hiding leaving many birds hungry. Others are mobbing the bird feeder. 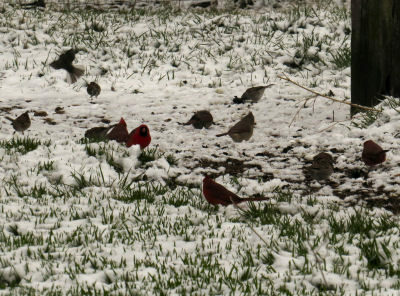 Spring grass pokes through the April snow, but the insects the cardinals seek are in hiding. Cold breezes don’t drift this snow. Instead the snow crusts over with an ice layer. The ground is slick. Walking is dangerous. The wind chill makes the air like a dose of ice water soaking through jackets and shirts. April snows are best viewed from inside the house. Wood heat warms the rooms. Snow muffles sounds and chases traffic away. April snows are nice to look at for a lazy afternoon. Then the snow needs to admit the day is too warm for snow. The April sun needs to remember it’s spring and make this snow a fading memory. Some of the special times of an Ozark year are in Exploring the Ozark Hills. My Ozark Home, a book of memories, photographs of my Ozark hills and haikus, will be released this fall. This entry was posted in Ozark Hills and tagged Ozark spring, snow clouds, snow in April on April 11, 2018 by [email protected]. 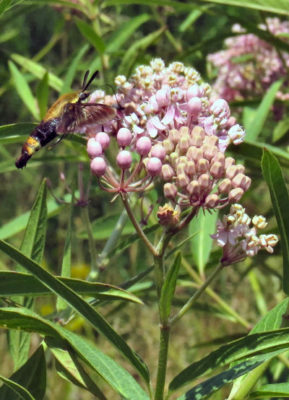 Milkweeds, genus Asclepias, are a hot topic recently because of the monarch butterflies. Their caterpillars only eat milkweeds which give them the chemicals making them taste bad to birds. Another plus for milkweeds is the abundant nectar they produce. Insects of all kinds descend on the flowers to feast on this bounty. 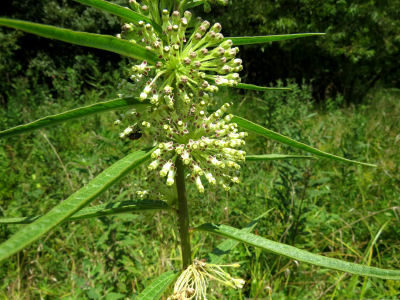 In spite of all this publicity, milkweeds remain an obscure group of plants. Many people don’t realize the number and variety of kinds of milkweeds found just in the United States. Each species has its own section. Photographs of the plants begin the section. A history of how the plant was discovered, the formal description – translated into English – and comments about the plant follow the photographs. Drawings from the original descriptions and drawings of the flowers done by Dr. Rintz complete the species sections. 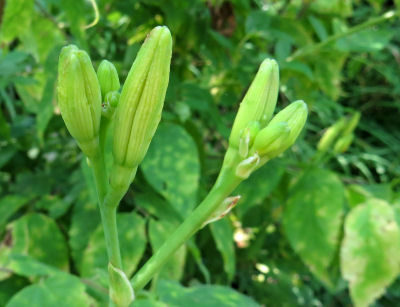 The last full treatment of Asclepias was done by Dr. Woodson in 1954. He organized the genus, tried to settle some of the name and species arguments and gave range maps for each of the species. More information about different species has come to light in the years since. Dr. Rintz has included this. These volumes are a botanical treatment of Asclepias. They can get very technical. They are intended to update Woodson’s monograph for botanists and serious amateurs interested in the genus. For the rest of us, these volumes have gorgeous photographs of milkweeds. Only the scientific names are given, but finding the common names is not difficult. Milkweeds vary from plants not much larger than a dollar bill growing on deep red sand dunes to eight foot tall erect leafless stems in the desert southwest to the broad-leaved plants common in my area of the Ozarks. The flowers all have the typical Asclepias five wells, but vary in color from white to yellow to pink to purple. The range is large and fascinating. The three volumes are privately printed, 8 1/2 by 11 inches and spiral bound. A set is $200 plus postage. For the present as copies are limited, if you wish to purchase a set, please contact me by email. 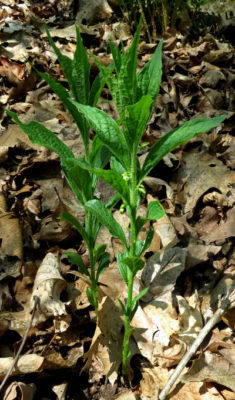 This entry was posted in Ozark Hills and tagged Asclepias, book on milkweeds, milkweeds on April 4, 2018 by [email protected]. What’s Growing In the Ravine? Spring is slowly fighting its way into the Ozarks. The weather has warmed, but still has cold days and nights. 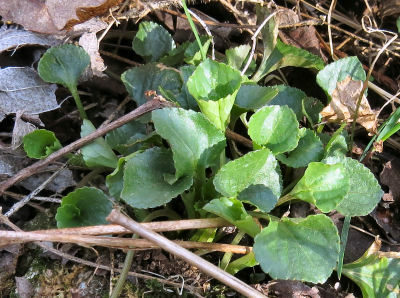 In spite of the challenges, wild plants are growing in the ravine. Actually they are growing all over, but the ravine is of special interest due to The Carduan Chronicles. I went out to see what’s growing. 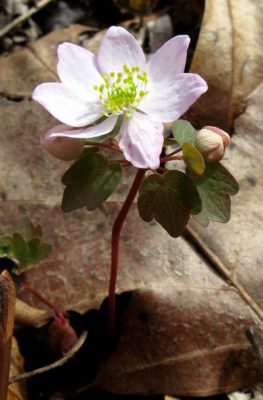 Finding a rue anemone in bloom in the ravine was a surprise. They are lovely, but I don’t think they are not edible. The Carduans will need to find plants to eat. 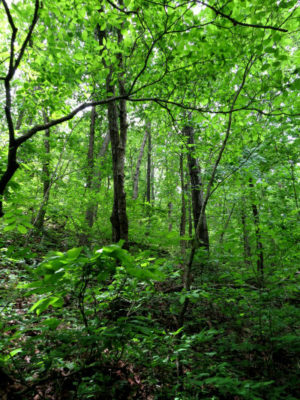 As they are confined in the ravine, due to their size and distances out of the ravine, the plants growing there will be the selection they will be drawing from. 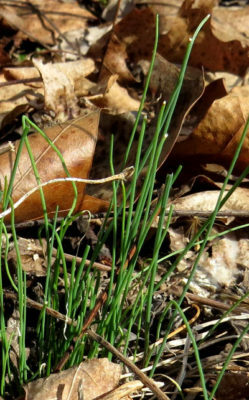 What’s growing in spite of wildly fluctuating temperatures? Lots of plants are putting out new growth. Many are ones I don’t recognize. Those I do recognize included galiums (bedstraws or cleavers), cinquefoil, wild strawberry, wild onion, two or three kinds of violets, toothwort, rue anemone and spicebush. There is a dandelion relative and several grasses growing in the ravine. 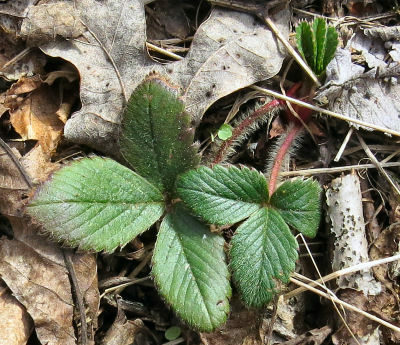 Wild Strawberry has small, edible fruits. The plant is easily identified by the three leaflets and hairy petioles. 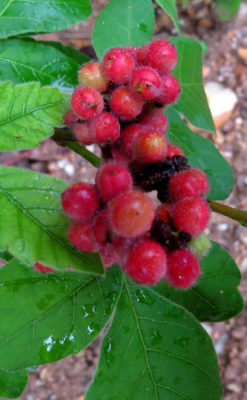 The fruits are hard to get as they are popular with many creatures. I need a picture of a ripe fruit and plan to cage a plant once it sets fruit so nothing makes the fruit disappear before I get a picture. Other than nuts that fall out of the trees in the fall, the Carduans will not be eating the trees. Thanks to “Botany In a Day” I have a few plants to taste test. It’s hard to describe how something tastes, if you have never tasted it. The best violets for fresh eating are blue and white ones. 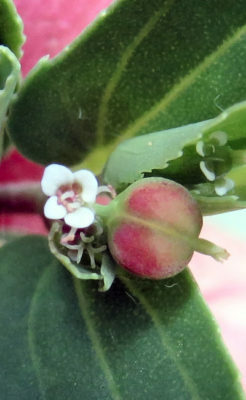 Both the leaves and flowers are edible. This is the blue violet coming up as all the leaves grow up from the rootstock. White violet leaves look much the same, but the plant has a stem with leaves from it. I found the blue violet leaves mild and the white violet leaves a bit bitter. I tried some violet leaves. The first one was from a blue violet. It wasn’t bad, kind of a tasty lettuce. The second was from a white violet. It was a bit bitter. Spicebush buds and flowers are bitter. I’ve tried the leaves before and found them spicy and palatable. These are not green onions. These are wild onions. They are edible. It’s easy to break off a leaf and eat it. The flavor is like a bite of regular onion and explodes in your mouth. The fun ones are the wild onions. These little things look like miniature green onion tops. They don’t taste like that. Wild onions explode in the mouth like a bit of raw yellow onion. Winter is giving up at the point I am in my writing. The Carduans are beginning to do some exploring. They want to know what’s growing in their ravine. Now that I know some of the plants growing in the ravine, I know what the Carduans will find. And what they will try eating. 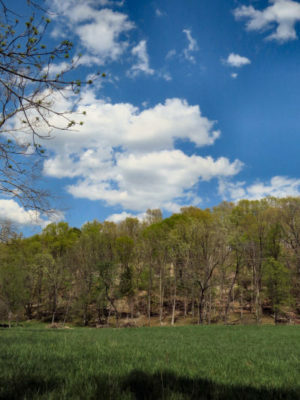 For more about the Ozarks in the spring, check out Exploring the Ozark Hills. This entry was posted in Ozark Hills and tagged blue violets, edible wild plants, Ozarks in the spring, rue anemone, white violets, wild onions, wild strawberry on March 28, 2018 by [email protected]. 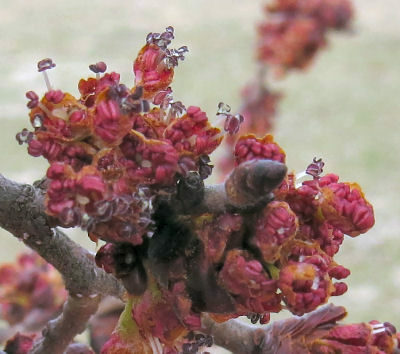 Most people think of redbuds and dogwoods, when tree flowers are mentioned. Those are big and showy. Most trees don’t have big, showy flowers. They have small flowers. Some have small flowers and catkins. Around here, the silver maples bloom first. Their clumps of red cup flowers burst after a few warm days. They often get frozen, but seem to be cold hardy. The next tree flowers belong to the elms. This slippery elm tree grows along a gravel road. Slippery elm is common on my hills. It is one of three listed for Dent County. The other two are American elm and winged elm. 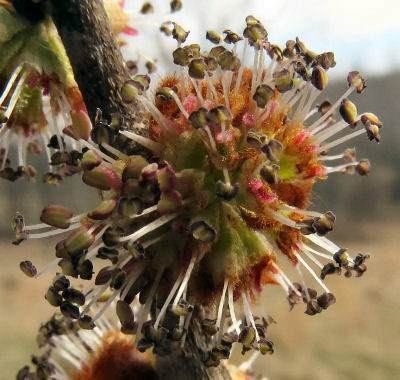 Slippery elm flowers do have red on them. There is a definite green calyx under the red. The flowers are wind pollinated so the pistils have large stigmas that reach out into the air to catch pollen floating by. There were American elms on my hills. They have died. I think there are winged elm along the road. It tends to be a small tree in fence rows. I’m still checking for it. Elms bloom before putting out leaves. I use leaves to identify trees. Elm blooms as a group are easy to spot. The kind is not, for me. I should have spotted and labeled these elms last summer or fall. Leaves fell before I got to the elms. 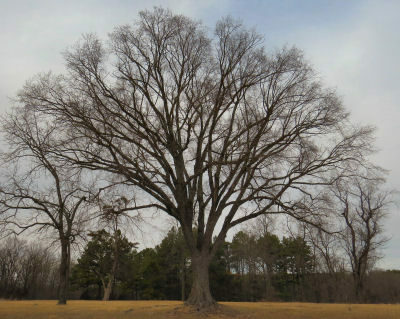 This is a magnificent elm tree. It grows near a parking lot at ShawneeMac Lakes Conservation Area. Once the leaves come out I will know what kind of elm. There is a lovely elm at a local conservation area. Getting a picture of the tree was easy. So was the bark. Not even my hook stick could reach the branches. I was in luck. The tree is next to a parking area. I pulled my truck up under the tree and climbed into the bed. Not high enough. The cab roof worked. So I now have pictures of the winter tree, bark, buds and flowers of this elm. Which elm is it? I’ll find out this summer when the leaves come out along with the seeds. My stick was long enough to snag a branch of elm tree flowers along my road. I’m pretty sure this is a slippery elm, but will wait for the leaves. The flowers were a different color, so I suspect is isn’t the same elm as the other one. These flowers are definitely elm flowers. They are very pink ones and different from the slippery elm flowers. March weather this year is a yoyo. Warm and cold fronts kick each other back and forth every few days. Warm days tempt the trees to break bud. Cold days warn them to wait. Several trees have labels on them. I’m waiting for them to bloom. Their buds are swelling. Every week I need to go by and look or I will miss these tree flowers. I don’t want to wait another year for my pictures. This entry was posted in Ozark Hills and tagged elm flowers, tree flowers on March 21, 2018 by [email protected].